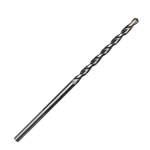 If you’re looking for carbide drill bits for masonry work, U.S. Diamond Tool offers many variations depending on your shank style and job type. Our rotary hammer bits are categorized by SDS shank, spline shank and straight shank to make finding compatible bits easier. No matter what type of rotary hammer you’re using you can find reliable hammer bits or carbide core bits that will help you complete your project. 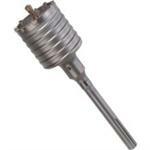 Most hammer bits are available in a variety of sizes to accommodate any job. Browse our sections below to find the correct size and shank type for your rotary hammer. If you’re not sure which hammer bit would be the best for a project, or you would like information about any of our products, contact us at 1-800-582-1429. Our staff will be glad to answer your questions and help you find the exact hammer bit you need. Incorporating the industry standard shank for carbide drilling bits, Milwaukee's SDS bits have carbide vacuum brazed to heat treated steel shanks. SDS MAX Carbide Bits feature the SDS MAX drive system for fast bit changes and efficient power transfer from the Hammer to the bit. Bits under 9/16 inch feature the highest quality carbide and provide two cutting edges. Four Cutter Spline Bits have a series of 12 spline that slide into an equal but opposite set of Spline in the drive system of the Spline Drive Hammer. Bits less than 9/16" diameter have two cutting edges. Designed to fit in all 1/2 in. three jaw hammer-drill chucks. The bits drill faster and last longer than other hammer-drill bits on the market due to their reinforced flute geometry and carbide tip design.